A visit by a US Secretary of State is a big event, and ordinarily it gets the full media treatment: meetings, talks, statements, lectures, television appearances, are all avidly followed, reported, talked about, scrutinised, and assessed. By that measure, Mr Kerry&’s recent visit to India was without the customary high octane exposure. He went through all the motions, met all the high dignitaries he was expected to meet, held extensive discussions with his counterparts, made a few carefully arranged public appearances, stressed the importance he attached to his country&’s relationship with India, but yet the visit did not spark the public response that might have been expected. Partly this was to do with the timing: Mr Kerry came to India when the country was daily learning more about the overwhelming scale of the disaster in Uttarakhand, so the channels and the papers scarcely had time for anything other than the grim events in the mountains. There were other reasons, too, for the relatively low key reception: Mr Kerry came here as a relatively unknown quantity and while from his days as Senator he was familiar enough with the realities of South Asia, his stronger contact had been with Pakistan. So maybe New Delhi felt the need to assess him and try to develop a suitable equation with him on this initial occasion. As it happens, there are no serious bilateral issues to be sorted out, no need for high level repair work, the relationship is in good shape and the challenge before Mr Kerry and his counterpart is to take it forward rather than to re-shape it, . There are nevertheless some matters where differences have become prominent. For India, it is important that there should be no undue stringencies in the grant of visas to Indian professionals in the IT field. This is not a new issue but the current discussions in the USA suggest that there is a real risk of Indian software companies being placed at serious disadvantage as a result of the more severe visa rules that may be promulgated. The USA has its own issues with India, prominent among them being protection for US investments in India. US companies have been eyeing the nuclear power industry in India but feel that Indian rules for foreign investment in this sector are too demanding and tend to discourage potential investors. Building nuclear power plants is a very complex matter and it has been argued that the USA may not be the front runner if India were to soften its rules and look more actively for foreign investment. Yet it was the famous India-US nuclear deal that opened the doors to external investment and the USA has consistently pushed for conditions that would simplify the entry of US and other foreign technology and investment. No resolution of these differences was achieved during the visit, nor was it expected. But even though both sides have real interests to defend and promote and have not yet found a way forward, they do not appear disenchanted and will keep trying. The formal setting for Mr Kerry&’s visit was the fourth round of the bilateral strategic dialogue. This is an ambitious, wide-ranging annual exercise that keeps leaders of the two countries in regular contact and seeks to establish common ground between them. ‘Strategic dialogues’ with partner countries have become somewhat commonplace and they seldom generate any extraordinary results, being in effect not much more than regular diplomatic consultations, but the India-US exercise, for obvious reasons, is a rather different matter. The US presence and its strategic decisions can be central to the future shape of Asia, so dialogue can be properly substantive, as indeed it seems to have been on this occasion. Dialogue on strategic issues can also reveal real differences where the two sides have to struggle to come up with convergent views. The future dispensation for Afghanistan is one such issue, currently perhaps the most important one. When Mr Kerry reached India, the US-backed initiative to talk to the ‘good’ Taliban was still reverberating, and this is something India has never favoured. Indeed, the confusion and discord caused by the proposed meeting in Qatar may well have been seen with wry satisfaction in New Delhi. Though the Qatar initiative may not get very far, the problem of political dealings with the Taliban remains and India&’s concerns about the re-emergence of an extremist source in its close neighbourhood needs to be addressed. The USA showed some sensitivity to India&’s concerns by sending its ‘AfPak’ envoy, Mr Dobbins, to brief governmental leaders in New Delhi. There is the linked question of Pakistan&’s part in this emerging process. This remains rather murky and it is sometimes feared that the military and other agencies may not have shed the ambitions nurtured in the heady days of the anti-Soviet campaign when Pakistan became the strategic pivot of the region. Mr Kerry spoke of positive expectations produced by the elections in Pakistan and expressed the hope that trade and investment between India and Pakistan would develop, which would in turn encourage others to follow suit. 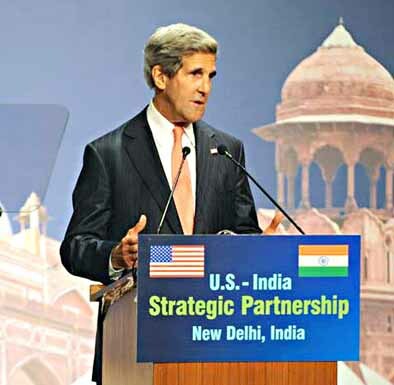 These are sentiments that India would support, and indeed India has long asked for the kind of pragmatic economic steps that Mr Kerry advocated. How to attain such a result is another matter and it is to be hoped that Mr Nawaz Sharif, who advocates better relations in economic matters, will be able to deal with the conservative no-changers in his army and security establishment. Looking further afield from South Asia, both India and the USA have received high level visitors from the recently installed Chinese leadership. There is currently some expectation in New Delhi that important developments on the India-China border dispute may be in the making, if not on the alignment of the border itself then on rules for its better management. At this time, too, the USA has embarked on a process of ‘re-balancing’ in Asia. What that entails has not been spelt out or discussed in any depth but whatever direction ‘re-balancing’ takes, its implications are bound to require scrutiny across the Asian continent. It can be inferred that something affecting the regional security architecture is being envisaged, which would be an appropriately challenging subject for the high-level strategic dialogue that has just taken place. The India-US dialogue has become something of an industry, with numerous groups of officials meeting at regular intervals on all manner of subjects. This may become bewildering at times but it is a pleasant contrast to the situation of a couple of decades ago, when the parties were deliberately reticent in their dealings with each other. Mr Kerry&’s visit involved no drama and produced few headlines. But it took the maturing relationship a step further in the direction both parties desire.